I have added a few links to other clubs within the IJKA. A new IJKA Bucks site just started by Dr Jonathan Lyons 5th Dan and blog written by a kohai. Well worth a look, you might even appear on their site or blog if you can attend the course with Kato Sensei at Radnage on the 7th March. 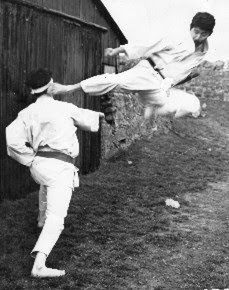 I would love to visit Sensei John Murray 4th Dan in Stornoway. Every time I look at the weather I look up at that western isle, it always seems to have a rain cloud over it! If I ever get the chance I would have to let Sensei Helen know I was going, the wee one has always wanted to get a little extra training in on the island as well. You may have to travel a little further to visit Sensei Yuriy Kopeykin, you may also have a few problems obtaining the necessary permissions and visa as well. 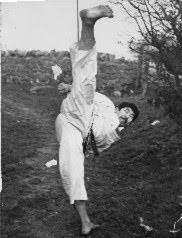 Sensei Brian Toomey 6th Dan - Chief Instructor of Ireland makes regular trips to the Ukraine to train with them, so their is someone available to explain how to get to the Satori dojo. For the moment I think I will have to just follow "on line". They must have perfect conditions for "Kangeiko" (cold/winter training) perhaps they will post some details soon? I have been working on the constitution for quite a few months and have eventually got round to finishing it tonight. I have posted it under the welfare section of the blog. It is not an exciting read, but a necessary administrative evil to have it recorded properly. Can I ask all members to read it and we will ask for formal feedback at the clubs AGM in May. Below is the Diary for this Year, it is quite full because we have strong ambitions for our club and its members for 2010.We plan to start with a "New Years" club meeting which we would like as many adult members and parents to attend. The Aim of the meeting is to discuss the outline of the attached calender and draft out an outline of actions for our club officials and members. If we leave this until the AGM we have wasted five months! I hope this will become an annual event to enable us to "kick start" out training and preparation for the year ahead. 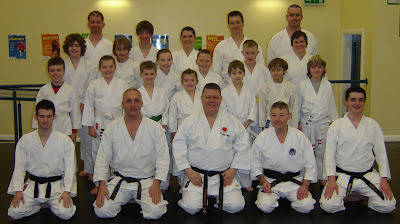 20th January 2010 SSKC Hambleton School 10 Week "Introduction to karate course"
I would like to wish all the readers of our blog a very Merry Christmas and a Happy New Year. I would encourage all of us to set ourselves a target/s for 2010, challenging, achievable but a target that will push you. At the end of 2010 you will be proud of what you have achieved. Without a target you are unlikely to meet your possible potential. I experience many similarities between serving in the military and the dojo. Push yourself to achieve and you will be surprised by your reward...self worth. To compete at the Army Martial Arts competition in March and improve on previous years performance. To run a bigger and better IJKA Yorkshire competition in May. To train harder than all of our students. Post grading is not a time to relax but to push forward. To take a squad to Tallin, Estonia in June. To remember my kata! I will learn all five Junro kata and probably introduce the first three to the dojo. The Selby Shotokan Karate Club would like to congratulate Campbell Sensei on his promotion to Rokudan following his examination at the JKS Hombu dojo in Tokyo, Sensei Ni Rei, Osu! We look forward to training with you in 2010, many thanks for your support in 2009 with your open invitation to join in all of your training, seminars and competitions. Osu! On Sunday we held our Christmas display for family and friends. It was a very cold and icey night that unfortunately lead to a few of our members not being able to make it. Considering the weather we all did well even to get to the dojo. The recently promoted Senei Dom took the warm ups followed by displays of Kihon, Kata and Kumite. This was followed by the presentation of the Sensei Jinks Cup and the club Christmas photo. This was the forth year that the Sensei Jinks Cup has been presented and the recipient Lewis Coward was very surprised when his name was announced. The cup is awarded as a recognition of a students perseverance in training. It is awarded to a student that does not find karate an easy way to follow, but despite everything trains regularly and happy to progress at their own pace. 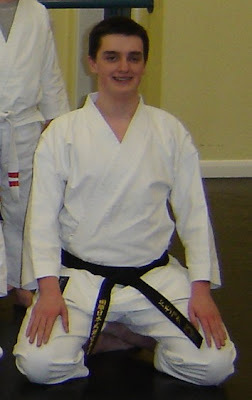 Lewis has trained regularly, he attends the Wednesday sessions at Hambleton when ever he can, and has represented the SSKC at the JKS nationals in Nottingham. Lewis, just enjoy your karate and keep depositing training hours in your karate bank. It was a special honour that Lewis was presented his trophy by Sensei Trevor Jinks himself, Sensei you are a motivation influence to us all, Sensei Ni Rei, Osu! Unfortunately there are three of our instructors missing from our photo, Sensei Helen who is currently working in the South of the country and Sensei Ian Culpan and Rebecca Brant both who have had to take a short break from training. We hope to see you both back and training hard in 2010. Nidan gradings in December? Merry Christmas and Happy New Year to all our members and friends, Osu! My thanks goes to Cunningham Sensei for mailing me a couple of photos from a not so recent course held by Kato Shihan in Co. Gallway, Ireland. I was only thinking at the weekend while training at the Hombu dojo at Whitchurch with Kato Sensei that I have been his student for just ten years. To my right were many karateka who had been dedicated Kohai for twenty....thirty....forty years..... plus. Our own chief instructor in Yorkshire Gullen Shihan - 7th Dan, has followed Kato Shihan for decades and is never failed to be amazed that he has never seen the same lesson twice. Update: Click on "Links" then "Tuam club" to see a picture of Crowe Sensei this week ...how spooky is that, on two separate blogs at the same time but nearly 35 years apart? Paul and Helen collected me and Rebecca on Friday night for the journey down to my third Whitchurch course. The first Saturday training session covered intensive training from 10:30 to the 'Raven' pub lunch. The Saturday training session concluded after the meal by learning and practicing multiple new Katas with subtle variations, making remembering them a greater challenge than normal. After a relatively early night on Saturday (2:00am!) I managed to get a good night's sleep before my grading on Sunday. Following a warm up and a few minutes of training, the karateka for the Dan gradings were called up for the grading session. Myself and Tom (from Haxby Dojo, grading for his 1st Kyu) were called up to begin our gradings with Kihon shortly followed by Jiyu-ippon with myself partnering Paul (grading for Nidan). After a breather, Tom, Paul, Helen (also grading for Nidan) and myself were then called to perform Bassai-Dai. I had originally expected to perform Jion (as my prepared Kata of choice), but had no opportunity as all of the Katas had been selected by Sensei. Following the other Dan gradings, Tom, Paul, Helen and myself performed Heian-Nidan as a final Kata to complete our gradings. We rejoined training after our gradings to complete the Sunday session with more Kata. 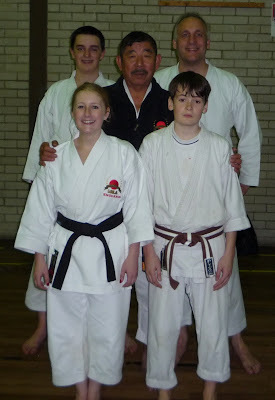 The results of the gradings were then announced by Kato Shihan, with all who took their respective grades passing. 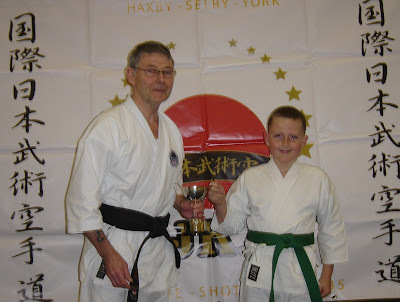 It has been 5 years since I started Karate at Selby Dojo under Sensei Ashley's teaching and have progressed through the ranks under the guidance and support of numerous instructors from Selby, Haxby and York Dojos. I would like to thank all those who have helped my Karate to develop to the present standard and am grateful for your time and effort (including patience!) over the years. I would like pay particular thanks to Sensei Paul for his persistence and encouragement in getting me involved with events outside of the club, such as the JKS Nationals in Nottingham and the Whitchurch courses; these new experiences have ultimately contributed towards my progression, overall attitude and confidence. 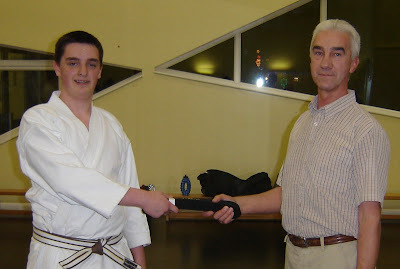 At training tonight I thought it only fitting that Bernard should present his son with his black belt. The belt was made specially for Dom in Japan and has the Kanji of the IJKA on one end and Dom's name on the other end. The belt is a gift from the club to Dom in recognition of many years dedication to Shotokan Karate and our club. Dom's Hirota belt should last a lifetime, the only way to wear it in will be many hours of further practice. Dom congratulations on reaching what should be considered the start of the next phase of your training. Osu! Dom was not the only SSKC member to grade this weekend, Paul Brant and Helen Milner graded to Nidan, gradings were undertaken at the IJKA Hombu dojo at Whitchurch by Kato Shihan 9th Dan - IJKA World Chief Instructor.